CDD sets the chiral flag to ‘absolute’ whenever you import from SD files or Molfiles. We do this to avoid unintentional duplicate structures and to ensure that structure search is consistent. If you need to record the relative stereochemistry of your compounds, use enhanced stereochemistry, which CDD now fully supports. When using enhanced stereochemistry, be sure to import and export using formats that support it, such as V3000 SD files and molfiles or CXSMILES (CDD’s SD file exports are V3000). As chiral compounds move through the early stages of drug discovery, the absolute stereochemistry of some atoms is often unknown, and accurately representing what is known is important. Back in ancient times, MDL tried to address this problem by adding a ‘chiral’ flag to their molfile format. If the flag was on, it meant that the stereochemistry was absolute. If it was off, the structure was either as drawn, or was the mirror image (with all stereocenters reversed). This standard has two crippling problems. First, most people are unaware that the flag is off by default, and they unintentionally create structures with relative stereochemistry. Second, the flag applies to all stereocenters in the molecule, an assumption that falls apart as soon as you have a structure where one stereocenter is known absolutely while others are relative. 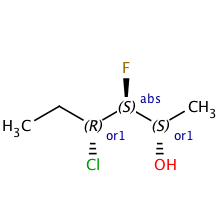 To address these shortcomings, the major cheminformatics packages (ChemDraw, Accelrys, ChemAxon, etc.) now support “enhanced” stereochemistry. This allows you to specify what is known about the stereochemistry of each atom individually. Here’s an overview of what’s available. As always, please contact support with any questions or concerns.